Let’s face it: Our current approach to change is running out of steam. And the cost of unaware people is too high to pay. In this age of acceleration, we need a fresh approach to living and leading. CONSCIOUS is our wake-up call – to be aware, awake, and accountable. Nothing is more important than understanding ourselves, our relationships, and our surroundings. Being conscious helps us think deeper, learn faster, and collaborate better. The more conscious we are, the faster we adapt, and the higher performing we become. Conscious is the new smart. 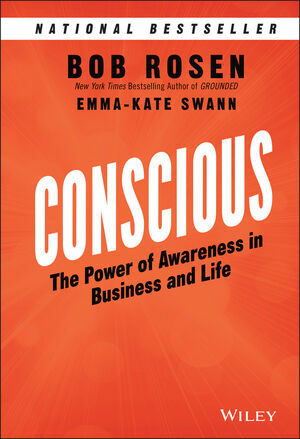 Conscious is your personal roadmap through transformation – helping you adapt and accelerate into the future. To create sustainable change for yourself and your business. Why not be the one with your head lights on while others are driving in the dark? BOB ROSEN is the founder and CEO of Healthy Companies. He is a trusted global CEO advisor, organizational psychologist, and bestselling author who has long been on a mission to transform the world of business. Healthy Companies has the singular goal of helping executives and managers achieve their leadership potential and build healthy, high-performing, and sustainable organizations. He is a global keynote speaker, media commentator and the author of Grounded: How Leaders Stay Rooted in an Uncertain World. EMMA-KATE SWANN is Vice President, Leadership and Transformation at Healthy Companies. She works alongside the team to both support and lead key client engagements. Swann coaches executives on optimizing their performance, helps organizations navigate through change, and guides executive teams in building more productive relationships.